Get your drivers on the road to success with GPS tracking tools. At the end of the day, fleet operations sink or swim on cost control. You can hire dynamic drivers and train them to maximize their time on the road, but budget allowances and fuel emission targets will preoccupy your conscience, regardless. Fleet managers don’t have the luxury of supervising the daily operations of their team first-hand. Since “driver behaviour has the potential to affect almost every aspect of a fleet operation” (FleetBusiness.com), the balancing act between trusting the employee and monitoring the employee continues to challenge fleet managers. You can meet that challenge head on with GPS tracking technology for your fleet vehicles. It’s our top tool for taking control of driver success. Tracking cost savings with GPS technology provides the backbone for driver incentive programs. “As long as the company can prove cost savings to the bottom line, revenue is passed on to the employees,” says Automotive-Fleet.com contributor Chad Simon. Set fuel targets for your drivers, and reward their success in meeting your goals. GPS tracking devices make it possible, monitoring speed, routes taken, and stops made on every journey. When your targets are met, drivers are rewarded, customers are satisfied, and everyone wins. “GPS data has been used for stolen vehicle recovery and to vindicate drivers against customer complaints about time issues and bogus accident claims,” Simon notes. Investigating workplace incidents with GPS data shows drivers that you provide fair assessment of each situation, and don’t automatically side with the customer. Drivers will feel encouraged to contribute to company success when they feel supported by their employer. Incorporate your GPS tracking strategy into your driver policy and training structure to get a head start on long-term proficiency. GPS devices monitor aggressive driving, hard braking, and inefficient routing. By clearly articulating driver rules, and outlining the consequences of these poor practices, you minimize the grey judgment area that leaves room for deviance. Drivers won’t be tempted to challenge the limits when they clearly understand the benefits and consequences of their behaviour on the road. 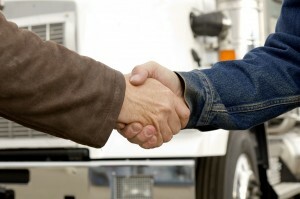 Give your drivers the tools to succeed with GPS tracking technology. With a positive approach, GPS tracking can spark ambition in your drivers, and help you take control of your fleet. Clearly, the benefits of GPS technology weren’t crafted for fleet managers only. Bring your professional team on board for cost control accomplishments. Which GPS driver success strategies will you use for your fleet?